This article is about the microgame from WarioWare: Smooth Moves. For the actual game, see WarioWare: Twisted!. Info "Turn the Form Baton and hold it like you would a Game Boy Advance. This should be easy for a seasoned WarioWare player like <player's name>, right? 2005: WarioWare: Twisted! / Game Boy Advance"
WarioWare: Twisted! is a microgame found in WarioWare: Smooth Moves in 9-Volt and 18-Volt's stage. It includes microgames from WarioWare: Twisted!. The object is to use the Wii Remote to turn the Game Boy Advance on the screen to complete the WarioWare: Twisted! microgame shown. Level 1: (Iron Stomach) Turn the Game Boy Advance to the right, then left, to pick up and eat the food. 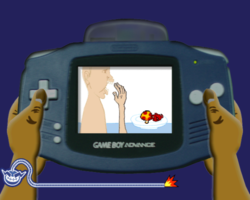 Level 2: (Cutting It Close) Turn the Game Boy Advance left and right to shave the face. Level 3: (Hat's Off) Turn the Game Boy Advance upside-down to make the hat fall off. This page was last edited on February 20, 2018, at 16:52.